And so does the searing disappointment that will undoubtedly accompany your failed attempt at a useful gift. So we were thinking: if you're planning on getting your dad another horrendous accessory to say that you care, well, it should at least involve beer. And holsters. 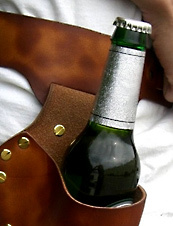 Introducing the Custom Leather Beer Holster, one of the most magnificent pieces of American engineering, ingenuity and plain old brio that has moseyed into our world in some time, available now on the World Wide Web. You may be acquainted with some of the Holster's more familiar ancestors—the always-popular coozie, the forever-classy beer helmet and the quietly dignified funnel. But your father is no heathen. He's no beer slob. He wears custom suits and deserves a sudsy tool belt made with the same level of craftsmanship and handsomeness as his Brionis. Which means it's time for you to spring into action—send in your father's hip measurements (mom will know), pick between black, oil-tanned brown or an antiqued brown for the belt, and choose the inscription that you want to see on the belt (how about "I regret nothing"). And if he doesn't like it, well, that should be familiar territory. And leave you with one handsome new belt.